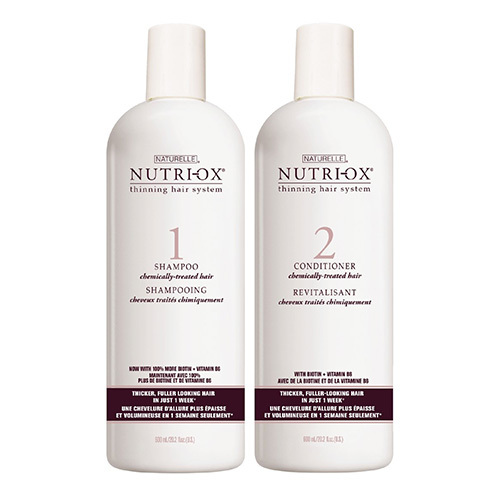 NUTRI-OX Shampoo and Conditioner was specifically designed for fine hair that is in noticeable stages of thinning. The gentle cleansing shampoo creates an optimal scalp environment for fuller, healthy-looking hair. Formulated with a strong blend of nutrients, proteins and humectants, it gently removes product buildup, environmental pollutants like DHT, and toxins from the hair and scalp. Now with 100% more Biotin & Vitamin B6. 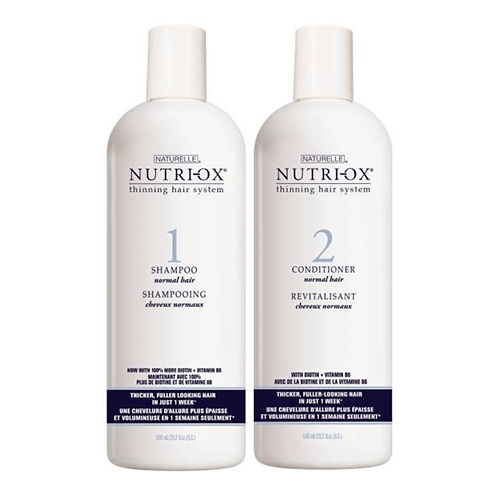 The cleansing features of NUTRI-OX allows your hair loss treatment (like 4hairlossMen or 4hairlossWomen) to be better absorbed into the hair and scalp. The shampoo exfoliates the scalp and unclogs the hair follicles to enhance absorption. The nourishing conditioner was developed to nourish the hair and scalp to create an optimum environment for healthy hair growth. It moisturizes and energizes the scalp, leaving hair looking and feeling fuller and strong with healthy luster. Blended with nutrient-rich botanicals and vitamins, it nourishes and hydrates the scalp and hair from root to tip. It balances moisture levels without weighing hair down and without clogging the hair follicle, which allows your hair loss treatment to be better absorbed into the scalp. My experience and opinion on this product: I’m a firm believer that anyone experiencing hair loss should be using a shampoo and conditioner that is specifically formulated for hair loss. A shampoo and conditioner for hair loss, in my experience, will not stop your hair loss. It does however make a good complement to a hair loss treatment like 4hairlossMen or 4hairlossWomen. I did a lot of research and testing of different shampoos and conditioners when deciding on what brand to carry on my website. NUTRI-OX was my top choice because it cleanses and nourishes the hair and scalp, and removes DHT build up in the follicle, so your hair loss treatment will better absorb into the scalp and be more effective. It also conditions well, it doesn’t weigh down the hair, it thickens the hair, and it is priced very affordable. I highly recommend using a shampoo and conditioner that is specifically formulated for hair loss/thinning hair and NUTRI-OX is my top choice. Includes a 90-day supply of Shampoo and Conditioner, two 20.2-ounce bottles of shampoo and two 20.2-ounce bottles of conditioner. The blue bottles are specifically formulated for normal hair and the red bottles are specifically formulated for chemically-treated hair.